On Saturday January 27th, and hosted by the Pittwater yacht club renowned for focusing on fun (the WPYC) the annual Putt Putt Regatta and Gentleman's Launch race takes place on the day after Australia Day, shifted from that date due to traffic on the estuary making racing unsuitable. The Gentlemen's Launch was scheduled to start at 11 am, the Putt Putts soon after. This year this was a staggered start from Treharne Cove, around Scotland Island anti clockwise. This document aims to define the objects of the Club so that its original concept may not be lost or diluted with the passage of time and/or Members, nor fundamentally changed in any way. Persons desiring otherwise are free to choose from numerous other boating clubs which may better serve their requirements. Founding Members of the Woody Point Yacht Club were a dedicated group of social drinkers with a boating problem. Their motivation was and is the enjoyment of the Pittwater and its inhabitants, largely facilitated by craft giving access to the remote foreshores and to the water itself. Suitable craft included tinnies, yachts, putt-putts, work boats, in fact anything that floats - and even some vessels whose buoyancy is questionable. These craft provide a platform for the many and varied pastimes enjoyed by Members, including fishing, yachting, putt-putt regattas, picnics, parties, breakfasts, etc. The Club does not favour a particular past time so long as a boat is involved either as a means to an end (ie. transport, fishing) or an end in itself (ie. sailing, cruising, just messing). The Club has a penchant for all things traditional - timber boats in particular - and prefers the simple family orientated atmosphere inherent in our unique community. A Commodore shall be elected by popular vote at the Annual General Meeting together with other office bearers as required. A Committee of five Members shall be responsible for organising all functions during the year. The camaraderie shared by Members is such that 'rules' in the normal sense are inappropriate and any semblance of formality is purely for the entertainment such pomp and ceremony usually provides. However, to maintain a friendly and intimate atmosphere, club membership shall be limited to 100 persons in any year on a first come first served basis. The club does not discriminate, even ladies and Kiwis are eligible to join. Senior citizens (capable of pulling beer) may also join and hold office. Sue Carter is the current Commodore of the Woody Point Yacht Club, backed up by stalwarts such asScotty Taylor, Vice-Commodore, and Ian Major. If this is a club you'd want to be part of, Membership details can be found here. Penny Gleen, Church Point Ferry Service, had the historic Elvina out and had a run against two other wooden classics, the Karoo and historic Reliance, another classic ferry still to be seen on the Pittwater. Penny posted afterwards, "Thanks for the race Adrian Matthews, Jane Matthews, and Mark Farrell." Jools Farrell and Penny both kindly shared some photos they took. Miss Tessa a bit tired after a day of fun on the water but so are we, great day had by all on the Woody Point Gentlemens Putt Putt Race! 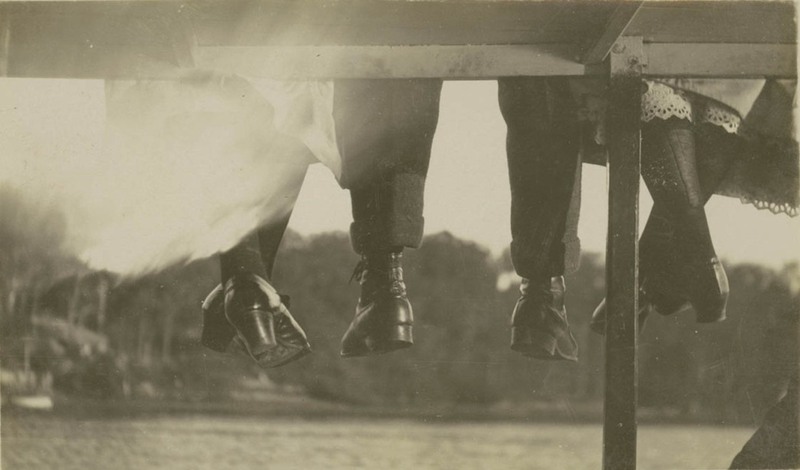 Legs of a man and two women dangling from the roof of a ferry [One man's and two women's legs as they sit on the roof of a ferry]. Hood, Sam, 1872-1953, from Album Hood Collection part II : [Postcards: Australian and overseas] Date of Work ca.1905-ca.1925. Image No. a342015. Courtesy State Library of NSW.